One reason I’ve posted less and less to my blog this year is because I’ve joined a Rotary club. Rotary has been a tremendous amount of fun and given me a real big buzz of feel good factor seeing the difference my effort, combined with others, can make as we ‘Do good things‘. 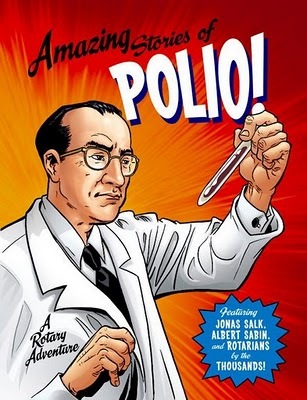 The best thing for me this year has to be converting an empty shop window in Canterbury to an educational display about Polio, re-using enlarged images from a comic called “Amazing Stories of Polio”. I’m going to unashamedly claim credit for the idea of this window display, or at least, I joined ideas from other places to come up with this one. However it wouldn’t have happened without the help, both in time, effort and resources of friends who shared the vision. We’re not talking a small effort either. From getting permission to re-use the artwork, to finding the shop, to the managing agent agreeing, to the graphic design, the printing of the large panels (which in itself took many hours) and the hours spent hanging them carefully in the window of the empty shop. I’ve still a lot of things to write about the window project and I’ll probably never be satisfied with anything enough to put it here in full. So, without further ado, why not follow this link to the artist, Steve Buccellato’s blog to read all about it. Other ideas are in the pipeline. I expect I’ll be posting less and less to this blog as a result.